Being an I.T. consultant in Manhattan you get to see some amazing places like the Trump Tower, Russian Tea Room and Rockefeller Center to name a few. I also came across one place I always wanted to go into and that’s L'Occitane. A high-end company from Paris that carries Men’s shaving products I’ve always wanted to try them. I’m currently on a budget so I had to be very selective and I finally picked the modest $12.00 shaving puck called Savon A Barbe Shaving Soap in the Cade scent. The puck comes in a simple box but the cashier gave me this little bag to carry it in. I didn’t want to walk around the city with this so I stuffed it in my tool bag until I got home. When you open the box the puck was wrapped in cellophane but I did see that you can purchase a beautiful aluminum shaving bowl and the puck together for $40.00. If I had the chance to do it again (and budget) I would opt to purchase both. The scent is a peppery cedar and with so much pepper added I think it could even make you sneeze. The website describes the scent as a spicy, woody fragrance that evokes the dry wood, red soil and hot stones found in the sunny Garrigue landscape of southern France. Top notes of bergamot lead to a generous heart of cedar wood and pink pepper. A base of cade wood and citrus linger. Enriched with essential oils of cade wood and pink pepper. It’s still a great scent but once you start to lather you’ll will notice that it fads quickly. This was the most disappointing aspect of the soap other than that I had no other issues with it. I loaded my brush after blooming the puck for several minutes and then began to apply. The face lather happened very quickly and turned into a rich creamy lather. At this point I noticed the scent starting to fade. The slickness and glide are very high on the scale and the post shave feel was very pleasant too. Normally you can detect some scent after your shave but with this soap it left me empty. I guess why leave you with a scent if they are willing to buy something else like the Cade Eau De Toilette. 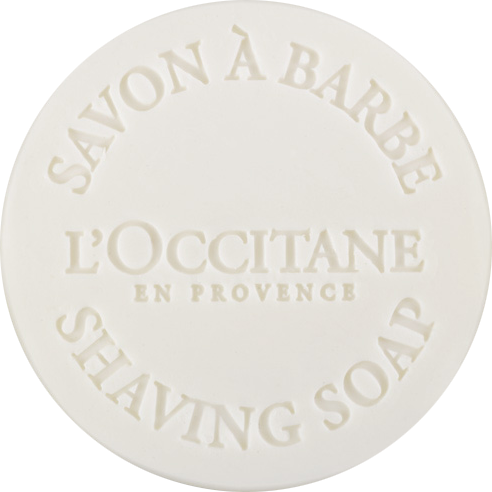 So, I liked L'Occitane shaving soap and will use it again in my rotation. If your looking to purchase the soap do yourself a favor and get the bowl & soap set.